This is the summary of consumer reviews for First Alert CO615 Carbon Monoxide Plug-In Alarm with Battery Backup and Digital Display. The BoolPool rating for this product is Very Good, with 4.20 stars, and the price range is $31.49-$41.99. Only one minor negative: the battery door latch isn't quite right - if you're not careful you can easily break it when trying to close the battery door. When you plugged the unit into the wall, the battery door flew open. Insertion of batteries was easy and I didn't find the door flimsy. Biggest flaw I've noticed thus far is that the back up battery compartment door has a very flimsy, cheap plastic latch to it, which I'm quite sure willbreak. The door catch is a horrible design. Only negative is,thickness about 2 inches, so it's easily noticed in the outlet. After the batteries are installed, the battery door (which is on the front of the unit) doesn't close. Brand new out of the package and the battery door was so poorly made that it wouldn't stay closed. First alert has done a great job in making this product user-friendly: Nice bright digital display, ability to silence the low-battery chirps for 8 hours (and by using an infra red remote if desired), ability to mount unit away from wall outlet. This model is recommended by Consumer Reports 2010, and Walmart has the least expensive price out there. This model is recommended by Consumer Reports. Consumer Reports claims this's the best CO detector of 2010, & Walmart had the best price:). Great reviews from buyers and Consumer Reports. It plugs into the wall with a battery backup, was highly rated by consumer reports and gives me the peace of mind that I've a reputable detector in case I need it. I've no desire to save a few bucks on a CO detector when it could put your life in danger, and bought it on the recommendation of a consumer reports rating. And Walmart has the least expensive price out there. I've more much peace of mind knowing that it'll show me what level is detected. The battery backup also gives more peace of mind. Install 2 AA batteries, plug it in, and you're done. The First Alert CO615 is simply plugged into a bedroom outlet after putting in the two AA penlight batteries. Easily plugs into the wall. The battery door opened easily, batteries were easy to put in. Product arrived in good packaging and included the 2 AA batteries needed for the back-up feature. It leaves one plug still open on a standard wall outlet, and you can test it with your TV remote. 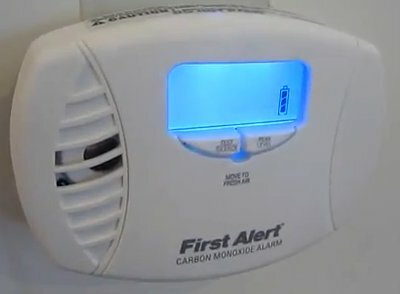 Excellent Carbon monoxide detector for the money, it plugs in to a wall outlet(also has a cord for plug in) and a battery backup. I love that it plugs into the wall, so I don't have to depend on batteries as the primary source of reliable power, and the unit has a generous amount of electric cable, so you aren't too limited to where you can place it once it's plugged in. Since live batteries are crucial, this unit *always* shows you the state of the batteries, with a little icon on the right side of the display. The battery door opened up with no problems, I placed the batteries inside, and it latched closed with equal ease. This's a very simple unit and the alarm/peak CO level tests are working so far. This unit comes with a set of batteries and plugs into to wall. I tried new batteries and plugging the unit into several different outlets. After receiving this unit, I followed the instructions and installed the batteries, plugged it in to the wall, verified that the "receiving power" light was lit, and pressed and held the Test/Silence button. You can plug in the unit at ground level and install it much higher, so you can read it easily, and also have the unit sense readings higher off the ground. On the plus side the unit plugs into a wall socket or the power adapter comes free from the unit and allows a remote installation. The right hand button is to display "Peak Level" not current level of CO. The CO Memory automatically resets itself back to zero every 24 hours. The best feature is the plug in design that lets you either plug directly into an outlet, or locate the unit further from the outlet with the extension & separate plug. I wanted to get a unit to monitor current CO levels in the room, a number displayed constantly and hands free. HOWEVER- the KIDDE CO Alarms DO measure peak readings below 30ppm. Other nice features are a peak CO ppm reading in a 24 hr period and unobtrusive dim green readout which turns bright blue for reading. All the reviews I read pointed towards this First Alert Co615 detector. The CO level only shows up if one presses a button. Have just recently replaced our old CO detectors with three of these First Alert CO615. You can also check the highest CO reading by hitting one button a good feature. 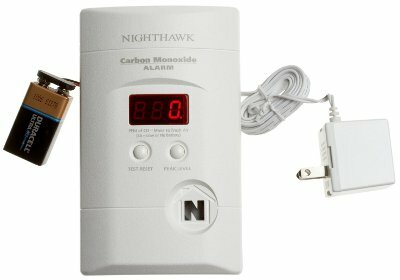 I bought the CO615 after seeing Consumer Reports rate it the best in its class and both CR and consumersearch.com claiming that it picked up low CO levels (~150ppm) faster than the Kidde Nighthawk models. It's better at detecting low levels of CO. I want to know my CO ppm level even if it doesn't trigger the alarm (mine was 0 ppm).